Soul on a String is a Chinese/Tibetan, Western/Adventure, ancient/modern warrior's tale, and these odd combinations are the reason that the film ultimately succeeds. This feature is hard to define, it straddles many borders while paying homage to many styles, but it is made just well enough to elicit respect, when it could easily have gone down a baffling and far less appealing route. Sacred stones, lone wolves, blood oaths, desperate journeys; this movie needed every one of its 140 minutes to tell a complicated story, but the result was surprisingly solid, especially when my expectations were so very low. Tabei has walked a crooked road, outpacing his demons for years, but they will finally catch up to him when he can flee no longer. He owes many debts, has angered many men, and is being hunted by a pair of brothers who must settle a family feud. 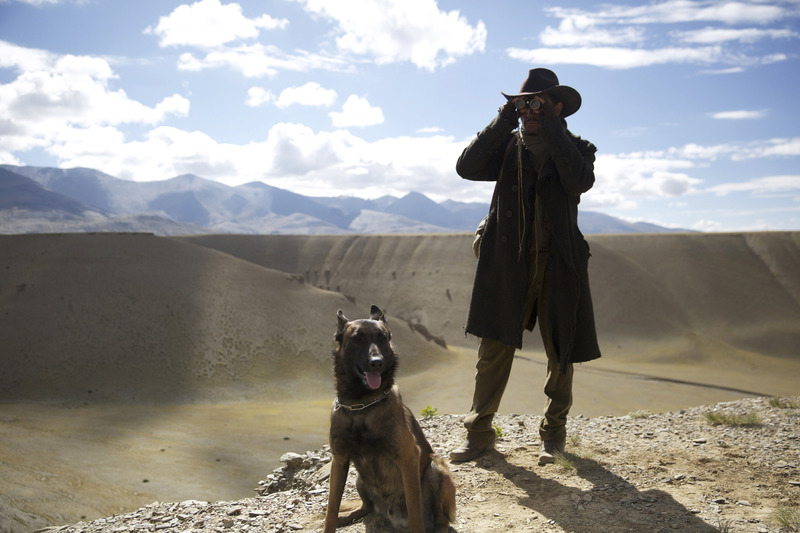 The list of his enemies is long, and even in the Tibetan wilderness, every man runs out of hiding places eventually. He will have to face his past transgressions before he can become a soul at peace, but his natural desire to escape always keeps him moving away from settling his debts, from confronting his mistakes head on. 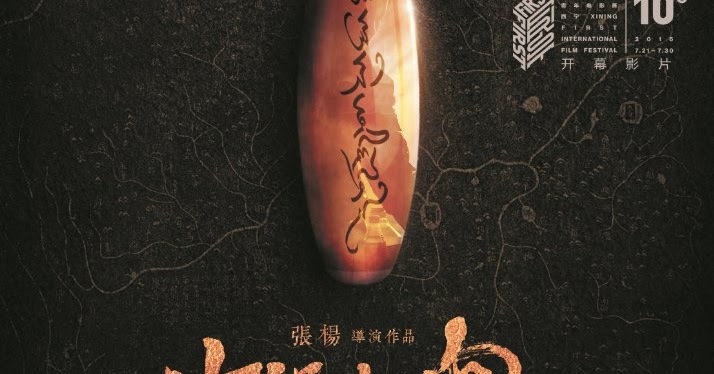 When Tabei is struck by lighting after finding a beautiful stone inside the mouth of a deer, the hunter begins his journey to hell, a place he undoubtedly belongs. But sacred priests revive him, draw him back from the underworld, and give him a mystical task; to take the precious stone to the holy land in the north, to drop his evil ways along the wayside of his path. Tabei begins his adventure, but his old enemies are drawing closer, the stone attracts those who would profit from it, the vengeful brothers won't give up their duty, and those he meets along the way will change his life in ways he never imagined. Soul on a String works when perhaps it shouldn't by combining multiple genres, melting multiple storylines, and cleverly manipulating time in such a way that audiences are left fascinated rather than bored. 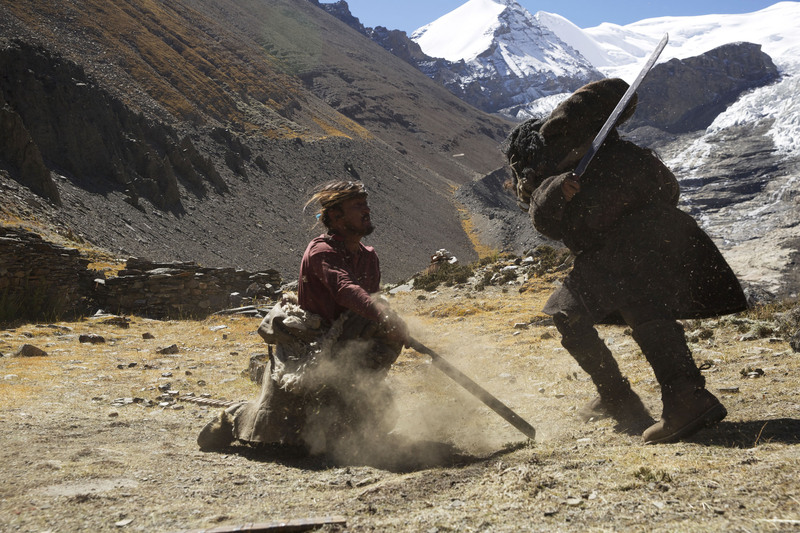 It's a Tibetan Western, but with broadswords as well as cowboys, landscapes devoid of any habitation as well as transistor radios. Director Yang Zhang is able to weave stories throughout that compliment each other and make each other more important, to tell a timeless tale that feels so ancient, centered around a culture that has stayed constant for so many years, yet with modernity hovering around the periphery like a wild dog keeping out of the light of a fire. It's this skill that makes this film something more than a throwaway foreign flick, that keeps it grounded and gives it more life than it would appear to have at first glance. There's some real wit used to producing this story this way, with some twists thrown in for your enjoyment and to keep you on your toes. A little humor is even scattered about to lighten the heavy load, to take us out of our heads for a moment, and to give us a taste of ridiculous reality. It's difficult to judge the acting, so much of the film is focused on the heavy mood and the slowly-plodding plot, but I would say all involved were solid in their performances. And I can't forget to mention the cinematography, the landscapes, wow, you might find yourself booking a flight to Tibet as soon as you can. This is a real winner of a film without being something that you'll remember for long, a cool piece of cinema that has surprises, but also never had a very high ceiling. Video: With an aspect ratio of 2.35:1 (Widescreen), the video quality of the DVD is excellent, with a real eye for landscape and detail that truly brings the story to life. The costumes, the sets, the countryside; it's a beautiful film to see, and the picture is clear throughout, a nice treat for those looking for strong cinematography and fine visuals. Audio: The disc was done in 5.1 Surround, with an option of 2.0 Stereo. The language is Tibetan, with an option of English subtitles. The audio quality is high as well, with rich, natural music that fits the country perfectly. The sound of the film is well-balanced and smooth. Extras: The only special feature on the DVD is a short film, The Rifle, The Jackal, the Wolf, and the Boy, an 18-minute movie from Lebanon about a pair of brothers who use their father's gun and the lesson learned from the experience. Recommended. Soul on a String is a unique artwork that deserves appreciation, but I would stop short of calling it one of its year's best. What it does well it does very well, but it still falls short of pleasing American audiences at least, perhaps being designed for a different group, a different expectation. It does surprise with its quality though, and does deliver a number of strong elements, from the visuals to the magnitude of its scope. The video is admirable, the audio is fine, there aren't many extras, so the technical side is a mixed bag. Watch for something a little unusual, a little magical, and mostly mood-driven, a film that might not blow Hollywood out of the water, but that still boasts a powerful punch.